Sony's last E3 show blew away audience members, with an impressive slew of new games, reboots, and surprises. Piecing everything together with an orchestra gave PlayStation a feel that was unlike any other press event. Can they do it again or will they be shown up by the competition? Sony's E3 show started off with what is arguably their biggest developer, Naughty Dog. Returning to the world of Uncharted, this new piece of standalone content -- which started off as a piece of DLC for DLC for Uncharted 4: A Thief's End -- returns Chloe and Nadine into the world of treasure hunting. This new story trailer shows off a deeper focus on story, set pieces, and closes off reminding us of their August 22 release date. A short trailer showed off Horizon Zero Dawn: The Frozen Wilds a new piece of DLC that adds more content onto the base game. A short, but sweet, trailer showed us more of the main character, Aloy. Any addition to [kwlink 30524]one of this year's best games[/kwlink] is more than welcome to me. Take a look at the new trailer below. Our first true chunk of unedited gameplay came from Sony's other big zombie game, Day's Gone. 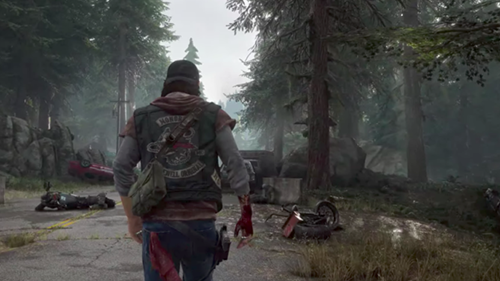 A motorcycle gang banding together during a zombie apocalypse is a unique spin on a video game staple but using it in a well-executed open world may set things apart. Fighting humans, zombies, and even concluding with a zombie bear shows some promise. Monster Hunter World brings the slow, strategic gameplay of the franchise to the PlayStation 4 (and Xbox One and PC.) The goofiness of the game's systems will be hitting consoles in early 2018. Here's the brand new trailer that's coming alongside it. Without too much hyperbole, Shadow of the Colossus is one of the greatest games of all time -- and one of the most important games I've personally ever played. The news that it was getting a remake would've been exciting enough but seeing this game in action proved that this will be a game worth returning to, or at the very least playing for the first time. An impressive reel full of PlayStation VR games surprised with a pair of games from Until Dawn developer Super Massive Games and the surprise that was a fishing game from Final Fantasy. But of everything shown for PSVR the biggest surprise to walk away with is that Skyim is going to be playable on PSVR, probably part of Bethesda's VR initiative. Following a gorgeous trailer for God of War and a reminder of Detroit: Become Human we got to see the real star of Sony's show, Spider-Man. Oh baby, did this game deliver. Gorgeous graphics, stylish combat, and the swinging looked as good as ever. You'll want to see this gameplay for this 2018 game. The final big E3 conference, what did you think? Was it a awesome as past years or on the underwhelming side? Share your thoughts in the comment section!